IP finance: How Much Is a Sports Sponsorship Really Worth? The trick in being the sponsor of an event is finding one whose benefits are so overwhelming that the sponsor enjoys oversized benefits in being associated with it. On that basis, surely the sponsorship of the recent Chicago Marathon by the Bank of America would seem to fit this bill perfectly. After all, according to the media packet provided by the Bank of America, 45,000 runners were to take part in the race, with more than one million spectators lining 26 miles of Chicago streets as the runners pass through 29 neighbourhoods (nowhere else in the U.S. is the notion of discrete urban neighbourhoods more hallowed than in Chicago). As a result, it is claimed, the Marathon will bring $171 million dollars redounding directly to the benefit of the city, with additional ripple effects further enlarging the supposed benefits of the event to the area. The problem is that this assessment may be wide of the mark. An article that appeared on the webez91.5 website ("Chicago marathon--bonanza or blip") here strenuously attempts to dispel these claimed benefits. 1. Of the 47,000 runners, 7,000 out from abroad, with another 19,000 runners from outside the Chicago area. That adds up to 26,000 runners in need of a hotel room, plus 4,000 additional rooms occupied by locals, with the result that 30,000 runners at an average price of $200 per room. That means $6 million in lodging revenues a night. 2. Direct spending--paraphernalia purchased by the runners and increased restaurant sales are expected to amount to $40 million. 3. Secondary effects, which the sponsors call "a trail of economic activity", adds another $100 million. Add these amounts together and voila -- we reach the $171 million dollar amount. 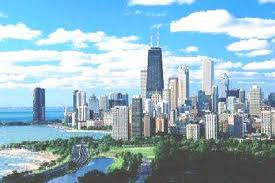 Such a sum would certainly bring tears of joy to new mayor of Chicago, Rahm Emanuel. 1. Say a souvenir cap is sold for $20. Most of the value in that cap was captured by the manufacturer, most likely not located in Chicago and probably located in the Far East. The direct value of the cap to Chicago is the mark-up, which amounts to several dollars. 2. Say a visitor pays $200 a night (or more) for a hotel room. Most hotels are headquartered outside of Chicago, which means that a certain portion of that amount is likely forwarded to the headquarters. 3. There is a bit of a set-off effect with respect to the spectators themselves. Assuming that most of them are from the Chicago area, some or even many of them simply exchange expending monies at another local site in favour of the Marathon event. The net gain, therefore, may be minimal. Should any of these revisionist calculations influence the decision of a sponsor, such as Bank of America, to serve as a sponsor for the event? My instincts tell me that the bank might be less interested, or simply not interested at all, to be connected with the Marathon if the much modest sum of $25 million more accurately reflects the contribution of the event to the local economy. Additionally, the cost to the bank of the sponsorship might be less if a lower valuation is given, negatively impacting on the sponsorship revenues of the City of Chicago for the event. In such a case, while it is not a lose-lose situation, it is certainly a greatly diminished version of the lofty figures being thrown about in the media. This debate reminds me of the current concern in Scotland that the Olympics will divert a lot of tourism revenues. As London serves as a major transport hub and first port of call for tourists, the high price of hotels during the Olympics may negatively affect other areas. Glastonbury is cancelled next year as the Olympics are using up the police and portable toilets.